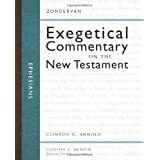 Ephesians (Zondervan Exegetical Commentary on the New Testament) ReviewZondervan has just released a new commentary series on the New Testament, with four titles available: Matthew, Galatians, Ephesians, and James. When I had the chance to grab an early reviewer's copy of Ephesians, I jumped on it! After having spent the last few weeks perusing the commentary, I can say that overall, it is definitely a good addition to my personal library. In the preface, author Clinton E. Arnold remarks that Ephesians is the book out of which he has most preached and taught over the years, and his love for this Pauline epistle comes across throughout this commentary. Arnold provides a detailed and robust introduction to the book that should leave the reader with no questions about the historical background of Ephesians. While this, of course, is standard fare for any commentary, his introduction is among the best and fullest I've read. In addition, Arnold provides a very nice section about the theology of the epistle at the end of the commentary, which means that the work provides not only detailed information about each verse of Ephesians, but it also steps back from the minutia and reviews key themes of the book at a broad level. This fact alone should be of much aid to anyone who uses this commentary for preaching or study. Regarding the actual, verse-by-verse commentary itself, I feel that Arnold has done a good job, although in this respect it is probably equally as good as WBC, BECNT, NIVAC, or any number of other commentary series. To be fair, Arnold does do the reader a service by providing the actual Greek text along with his translation and by providing paragraph diagrams, which include layman's descriptions of the various parts of Greek syntax that Paul is using. Arnold also frequently refers to Wallace and BDAG in the footnotes, which makes diving deeper into a word or phrase much easier for the intermediate-and-above student of Greek. In the end, however, one should not expect to find much new and ground-breaking material in the commentary section. Used in conjunction with several other commentaries on Ephesians, though, it will still be of great help. Want to learn more information about Ephesians (Zondervan Exegetical Commentary on the New Testament)?